I’m absolutely hooked on MELT. I know it will be a valuable part of my fitness routine for years to come. MELT is really a form of self massage. It’s immediately evident to me after the class how great it is for my circulation. I’m a huge fan of the benefits of massage, so MELT had me from the very first class. At the end of a long work week, I sometimes hold tension in my shoulders. When we roll our shoulders on the large foam MELT rollers, I feel that tension releasing, and by the time the class is over, I feel great. I was fortunate to take a seminar at the West Side YMCA in New York City with Sue Hitzmann, the founder and creator of the MELT Method. She explained in simple terms how she came to create the practice. She began exploring the connective tissue just below the surface of the skin after researching a puzzling injury that was plaguing her. She explained that MELT stands for Myofascial Energetic Length Technique. Sue developed the method, seeking to hydrate the connective tissue and ease pain. I am grateful not to be experiencing chronic pain, but many who have pain recommend MELT as a wonderful tool if used regularly. She walked us through the compressions and various movements— using small rubber balls on our hands and feet to reinvigorate the connective tissue. We also a soft foam MELT roller to realign our spines and get rid of “stuck stress” in our bodies. I had already been loving my MELT classes at the West Side YMCA, but taking this seminar with Sue made me even more of a devotee. MELT is still fairly new, but it’s catching on fast. Hitzmann published her book on MELT in 2013. Some of her techniques are not new— drawing from reflexology, self-massage, work on pressure-points, etc. But the way she brings it all together is distinctive, effective and gentle. Many people in my class at the YMCA are older adults. But MELT will help you get in touch with your body’s alignment and alleviate stress in a way that people of any age or fitness level will appreciate. I feel great when I do 20 minutes at home on my roller and using my MELT balls on my feet and hands. But I feel fantastic when I take an hour-long class and really focus on doing the moves correctly. This is when a good teacher truly benefits you. 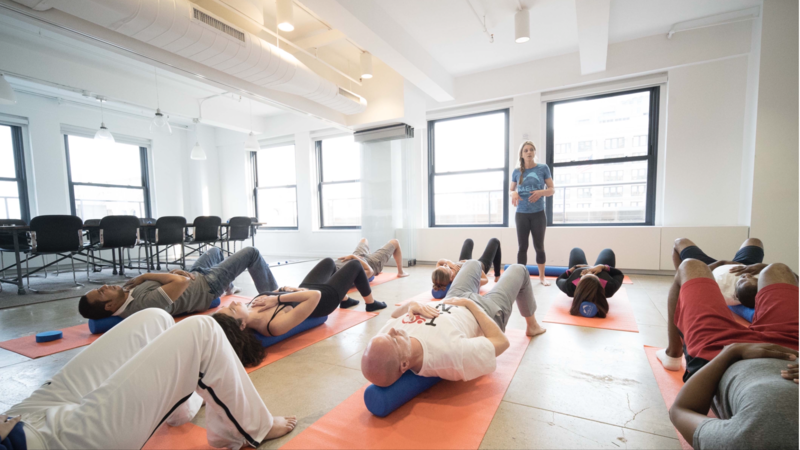 I love my Saturday afternoon class at the West Side YMCA in New York City with Jonathan Drayer, a great instructor who provides really good direction to help you get maximum benefit from the positions. We start class with an assessment. How is your body feeling today? Are you balanced? Are you stiff in one area? Even this simple assessment makes you more attuned to things you might have been overlooking. Then, we usually move on to the feet, one of my favorite parts of the MELT practice. The injury that began Sue’s research was an injury in her heel, so obviously she has really focused on the feet, and how they can contribute to the balance and well being in the rest of our bodies. We place a small rubber ball under each foot, pressing down with each toe knuckle and moving through a series of pressure points on the arch and heel of the foot. Many people feel an improved sense of balance and alignment from the very first time that they move through the sequence, as I did. If you’ve ever had a reflexology foot massage, you’ll understand how beneficial this can be. Depending on the focus of the class, Jonathan might emphasize our lower bodies or our head and shoulders, spending more time on addressing a particular part of the body. Pretty much all the classes address areas that harbor stress— our hips, shoulders, temples, and jaw. Placing a soft roller under our spines, rolling back and forth and tiling the pelvis, in a short time, the body is realigned. In nearly every class, we balance our pelvis area on the foam roller and do exercises involving rotations of the hips. I can see how this would help minimize falls as I get older — to keep mobility and strength in this key area. MELT is also great for balance, another plus for any age, but especially older people. Techniques of focused breathing bring relaxation and mindfulness. Like in my yoga practice, by mentally focusing on the instructions I’m not thinking about what I need to do later that day. I’m there in the room doing something that makes my body feel great. I feel so refreshed after MELT, in some ways, even better than when I’ve had a massage. I usually drink water after class, as recommended, to help rehydrate the body and flush through what was expelled from the connective tissue. Sometimes if I’m stressed, I pull out my MELT roller for 10 or 15 minutes and quickly roll the stress out of my upper back and shoulders. It’s an immediate stress release, and one of the main reasons why I plan to keep MELT as part of my wellness routine for the decades to come. This is not a sponsored post. I just want to share the benefits I have gained from my MELT practice. 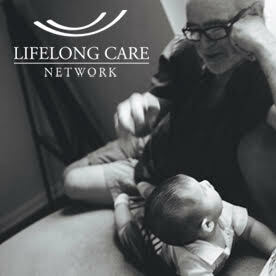 I always look forward to reading The Good Long Life posts and this one is super! It’s so true about holding stress and these techniques seem like a great answer. Thanks for all of the helpful links. So many times there is helpful advice but it takes so much time to find a good resource. Thanks so much, Nataly. There are quite a few places to try the MELT Method in New York City. Give it a try, and you’ll be hooked, too!